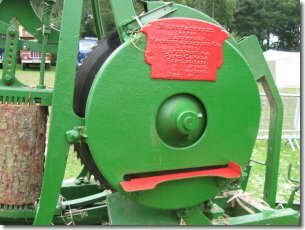 This Mill was originally bought in Port Hawkesbury, Nova Scotia by Elmer Hart, where he ran the mill for several years along side other mill in his yard. 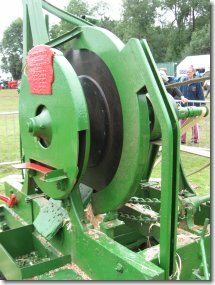 When these mill were first made they were being used to manufacturer boards for apple crates, not shingles but board. 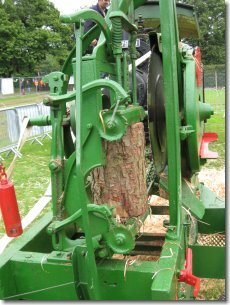 This changed when a board came off the saw as a shingle which changed to use and purpose of these machines. 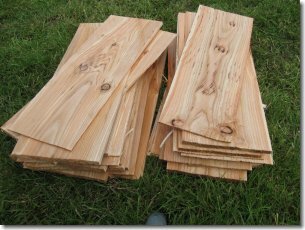 use these Cedarwood shingle as tiles to their roofs. Shingle are used as a roofing material. 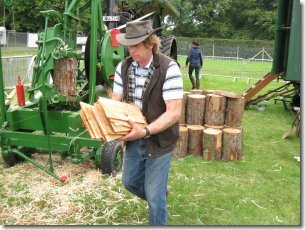 The wood is cut to a thin taper, so that one end is paper thin and the other about one to two centimetre's thick making them easier to layer on top of each other to form a solid sealed roof. Shingles are mainly used on buildings in areas of oustanding natural beauty and garden furniture as they are in keeping and blend into the countryside very well. 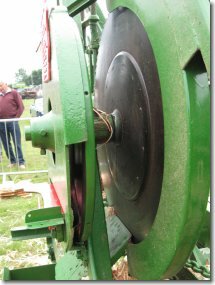 This type of Shingle Mill is a "Swinging Arm" type. 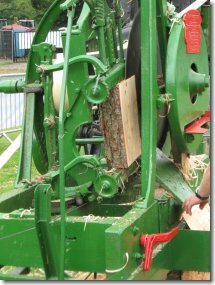 The arm can be engaged and dis-engaged from the drive to load the logs / blocks of wood, which is mainly cedar. 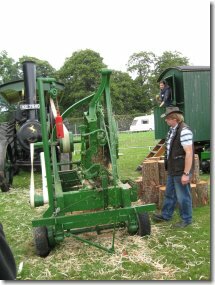 Here the arm holding the log can bee seen "swinging" across the blade and cutting the log. 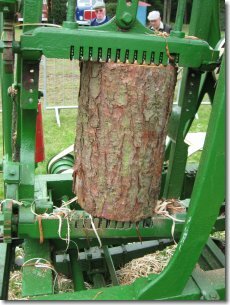 After each cut the swinging arm returns to the start point and the log is angled over by one / two centimetre's to form the taper of the shingle , as explained above. 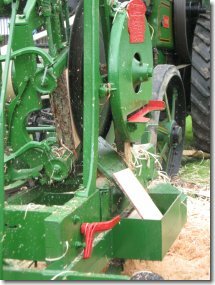 You can see the toothed cogged at top of & bottom of log, aswell as having opposite direction movment of the coggs it also has off-set teeth, this is because it moves the log to angled then square, to angled then square for each new cut. This in turn give you the taper on the shingle. 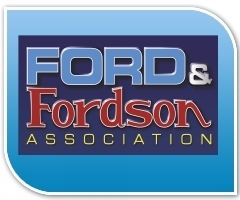 I really enjoyed watching this working as "it is so simple,but so clever" and manufactured so many years ago. 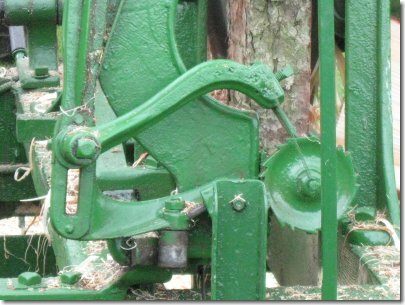 This part of the mill is called the "Jointer". 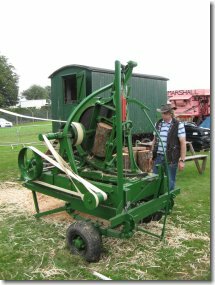 After a shingle has been sawn off the log / block of wood ,it has to be trued and squared up. 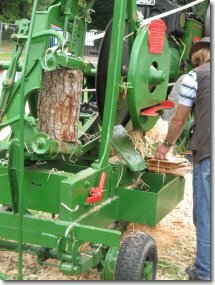 The Operator of the mill tries to position the log / block of wood, so that any knots would be close to the edge of the cut shingle, that way they can be trimmed of when he was squaring / trueing the shingles. In the Jointer blade there are slotted holes that cut the shingle. 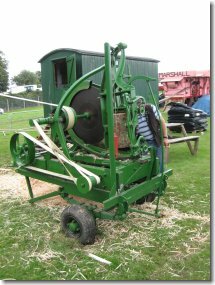 This Mumford Mill was sold to Jeff Burgess and shipped to England in 2011, Jeff can be seen in the photos above working the very rare "Shingle Mill" at the Kent County Show Heritage Section. 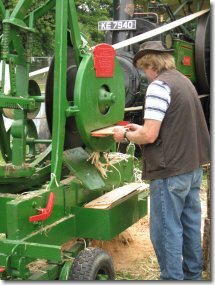 Thank you Jeff, it was great to watch this mill working away.